Dave Brandon: The resignation of Michigan’s villainous athletic director is why we like college sports. The resignation of the Wolverines’ villainous athletic director is why we like college sports. 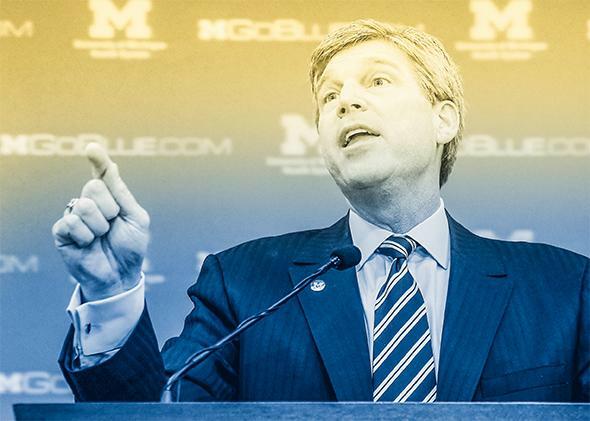 As Michigan’s athletic director, Dave Brandon bristled against student and alumni criticism. On Sept. 27, the Michigan football team was losing badly at home to Minnesota, a team the Wolverines typically destroy. The loss would drop Michigan to 2–3 on the season, a new low point for a program that’s found a number of creative ways to embarrass itself over the last few years. The student section, looking for a scapegoat, broke into chants. The first was “Fire Brady,” referring to the team’s beleaguered head coach, Brady Hoke. Their next demand was much more unusual: “Fire Brandon,” the students shouted, calling for the head of Michigan’s unusually high-profile, and unusually unpopular, athletic director Dave Brandon. Today, the students more or less got what they were asking for: Brandon resigned, his departure covered on ESPN’s bottom-line ticker and in the New York Times. How did a college athletics administrator end up making national news? As the chant indicates, he did it by going to war with his team’s fans—and, hearteningly, losing. Brandon, a former Domino’s Pizza CEO, was never beloved by Michigan fans. He jacked up ticket prices and created a hyped-up, corporate culture—novelty, made-for-TV matchups and novelty, made-for-TV uniforms—around a program whose supporters take pride (maybe too much pride) in their respect for tradition. Amid the deluge of bad press, Brandon remained, as they say, defiant, reportedly attributing the movement against him to electoral politics. (The University of Michigan is supervised by regents who declare party affiliations and are chosen via statewide vote.) It was the kind of spin he’d gotten away with many times before—as others have observed, Brandon’s usual response to backlash against his decisions is to blame someone else for them in a mealy-mouthed press release. He also had the public support of Stephen Ross, a real-estate billionaire and perhaps the most important man in Michigan’s vast network of alumni donors. As the weeks went on and Brandon remained in his job, Michigan fans like me started to get a sinking feeling. How many times have we seen fans “rebel” against their team’s incompetent management to no effect whatsoever? The Knicks’ James Dolan, the Florida Marlins’ Jeffrey Loria, the Washington NFL franchise’s Dan Snyder—I could go on. Sports fans don’t have a lot of power—sure, they can stop going to games, but stubborn owners can ride out declines in revenue, especially given how much of their money comes from national TV deals shared with other teams. (Not to mention how many of them inherited their teams as part of larger family fortunes that can help cover losses.) A perennial state of justified but futile outrage is the norm for many of us. But, as you may already have observed, college teams don’t have owners. Even someone as rich as Stephen Ross doesn’t get to have the final say on Dave Brandon’s job (although, perhaps realizing which way the wind was blowing, Ross said this week that he would not object if Brandon were replaced). That authority belongs to the school’s president, who must make decisions not on the principle of “I own the team so I can do whatever I want,” but by weighing the input of interested ticketholders, students, alumni, former players, and donors. Or, described collectively, fans. Michigan’s president, Mark Schlissel, has been on something of a listening tour in the past few weeks, appearing at various public and private meetings within the university community and making carefully worded statements empathizing with fan frustration. Schlissel acknowledged the crisis, took public control of it, and nudged along the consensus that it was time for Brandon’s departure. It got to the point this week that the embattled A.D. had no choice but to come to that realization himself. It was a story of leaders channeling and managing popular opinion that could have come out of a civics textbook, right down to the compromise at the end. (Brandon gets to say he left on his own terms, and will receive the full $3 million he had left on his contract). That college sports have a democratic element isn’t an unqualified advantage—for an example of what can go wrong in a consensus-based system, see 90 percent of American political news on any given day. But the fact that the community around college teams is an actual grassroots community does account for much of those teams’ appeal. (It’s worth noting that one of the most beloved and successful NFL franchises—the Green Bay Packers—is literally community-owned.) Over the last few months in Ann Arbor, the fans spoke and a team listened. When’s the last time you could say that?